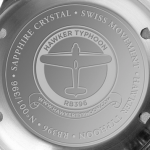 Working in partnership with watchmaker RSC, the team here at the Hawker Typhoon Preservation Group has designed this stunning limited edition wristwatch. In accordance with our pledge to members of our Supporters’ Club this watch was released to them, in advance of going on general sale, late on Thursday. In order for the watch to go into production, 50 out of the 396 available, must be sold. In just two days, the campaign has been fully funded, with 50 sold, meaning the watches will go into production. 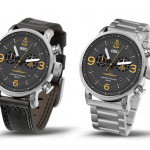 The watch is now available to pre-order, meaning you too can purchase one of these exclusive, limited edition wristwatches, with all profits going to the charity to assist with the rebuild effort. At Duxford’s September airshow last year, an idea was born between the project trustees, and Guido Steffen from watchmakers RSC. This idea was cultivated over the winter, with probably hundreds of hours of design work and going back and forth between the project, and RSC, who are based in Belgium. The result is this stunning, limited edition chronograph, designed specifically for the project, with many small touches that make it completely unique. Only 396 of these chronographs will ever be made, and they could contribute as much as £40,000 to the rebuild effort! 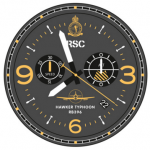 The full spec of this lovely wristwatch is below, but small touches such as the 174 sqn crest, rockets as 5 minute markers, 3, 9 & 6 highlighted and the project’s gold colouring, aircraft artwork and name make the watch very special indeed. On the reverse of the case is an engraving of the project logo and they come with a choice of straps. The way our partners RSC bring a new watch like this to the market is through “Crowdfunding”, you may or may not be familiar with this term so we shall briefly explain. There is a “pre-sale” period (30 days), in which the watch is advertised, and can be pre-ordered. There is a minimum number of watches that must be sold during this period for the watch to go into production, and this minimum number is 50 watches. When the minimum number of watches have been sold, then the watch will go into production at the end of the pre-sale period, with approximately a 3 month lead time to delivery. They will then remain in production, until all 396 have been sold. First backers – the first 38 to buy can reserve theirs for £274.99 (approx. 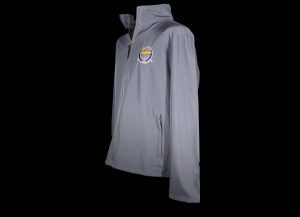 €316 or $390) – Supporters’ Club members took advantage of these, and they’re all gone! The benefit of being a member of the Supporters’ Club, when it comes to something like this, is plain to see. The discounted “first backer” price is a saving of £25 – which is equal to the cost of an individual annual membership. By being in the club, many members were able to take advantage of this discounted rate, before the watches were made available publicly. Members also benefit from invites to exclusive events, including members’ days at the project’s base, inside information relating to the project and much, much more. If you would like to join the Supporters’ Club to take advantage of all these benefits and future offers, please click here. Now you can purchase one of these limited edition wristwatches, remember only 396 will ever be constructed, and when they are gone, they are gone!